Lichen sclerosus (LS) is a chronic inflammatory disorder of the skin. The incidence in the Western world is underreported. In men, LS peaks between the ages of 30 and 60 years. Both genders can be affected, although genital involvement is much more common in women. Possible etiologies for LS are the Koebner phenomenon, genetic susceptibility and autoimmunity, oxidative stress, and infection. The clinical presentation is as white patches that seem to coalesce into “plaques” that can affect the prepuce and glans. It is not clear whether LS spreads by direct extension into the fossa navicularis and a portion of the anterior urethra or if urethral involvement is secondary to LS-induced meatal stenosis and subsequent inflammation of the glands of Littré. The classic radiographic appearance of LS anterior urethral stricture is a saw-toothed pattern. 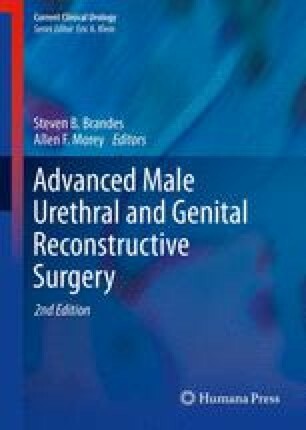 Surgical management of LS is primarily by staged urethroplasty.